Requests must be submitted on the Document Delivery web form. Registration with the libraries is required (see below). The form is also linked through the that you find beside results in article databases and the Document Delivery option found under the "More Options" tab in the Novanet catalogue results. To use the document delivery web form you must be registered in the libraries Circulation database. You can register at the Service Point/Circulation desk at any of the Dalhousie Libraries. Dalhousie faculty and students can also use the online registration form. If you register in person the Document Delivery request form will be available to you immediately. If you use the online registration form please allow 24 hours for staff to complete your registration before accessing the Document Delivery request form. 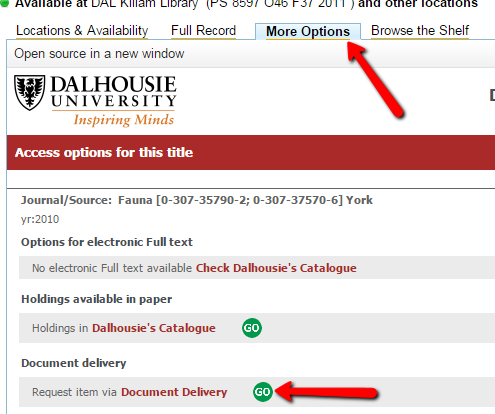 When submitting your first request, ensure that you do so via the Dalhousie Library website. Please note that whenever you login to the Dalhousie document delivery webform, you should see your name at the top of the form. Your contact details and delivery address should be at the bottom of the form. When you submit a document delivery request you will receive a confirmation of your request via email which will include a PDA request number. If you encounter any problems logging into the request forms please contact the Document Delivery department at docdel@dal.ca or 902-494-3612. Contact the Service Point staff at any Dalhousie Library. Staff can help you reset your password.